No other pew Bible on the market offers such high quality with as many features for such a low price. Designed to withstand years of constant use, the Boldtext features excellent construction and finishing details. 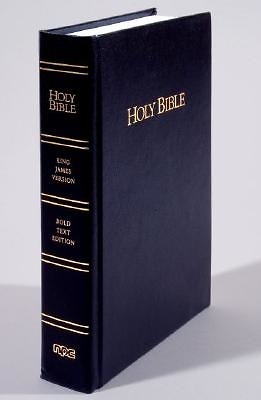 The classic King James text is printed in two columns with heavy 10-point< br> black letter type that senior citizens, people with vision difficulties, and beginning readers alike will appreciate. Other features include gold stamped cover & spine; Presentation Page; pronunciation marks for proper names; headbands and reinforced end papers for extra strength; and, white page< br> edges. Bound in black imitation leather over board.